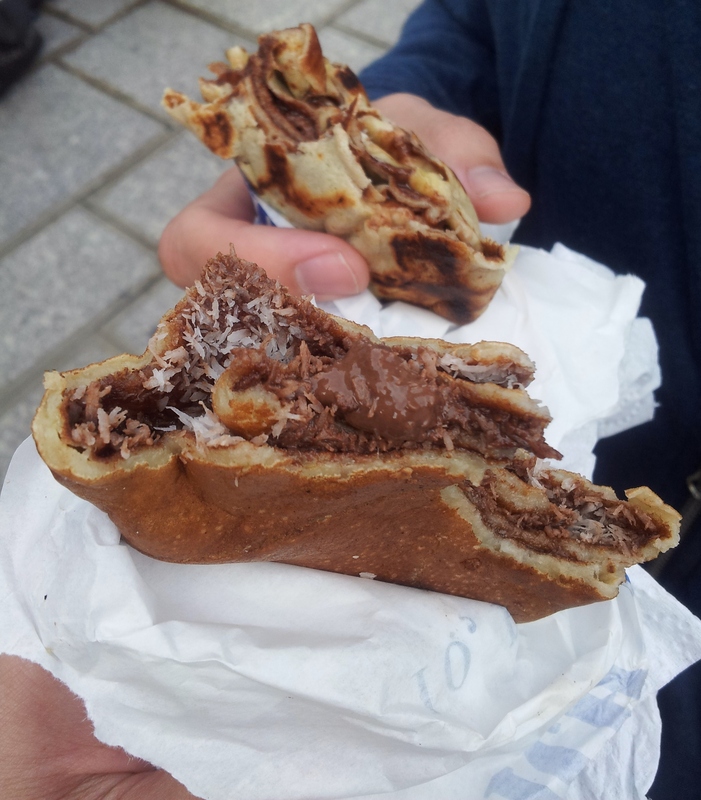 One of my very favourite foods I ate while strolling the streets of Paris were crepes, usually filled with Nutella and banana, desiccated coconut or all three together. 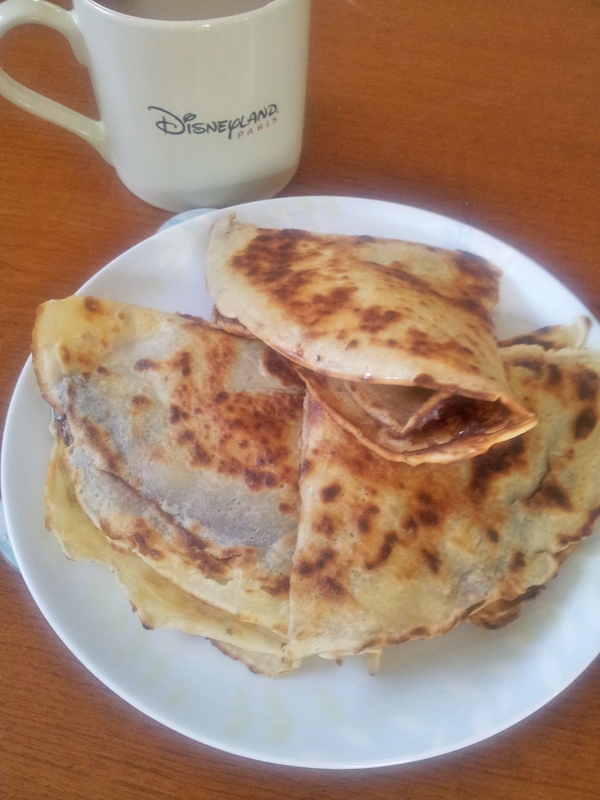 Soft, warm and filled with melting Nutella, they were the perfect antidote to the chilly June days. This photo is of my Nutella and coconut crêpe (foreground) and Mr t2k’s Nutella and banana crêpe (in the background), taken in Paris one morning. We also went on a shopping trip to E. Dehillerin (Julia Child’s favourite Parisian kitchenware store) on our last day, so I picked up a crêpe pan in hopes of re-creating one of my favourite French treats at home. After a couple of trial runs, I’ve got a recipe I’m happy with and a few tips to share. I’m not sure about the authenticity of this recipe but I can say that one bite of these crepes on a Sunday morning has me straight back in the streets of Paris, the stress of the week melting away. In a small bowl, whisk together the milk, eggs and 15g of melted butter until frothy. Into a large bowl, sift the flour and stir in the salt. Make a well in the centre of the flour mixture and pour in the milk mixture, gradually incorporating the flour until the mixture is smooth. Don’t be concerned at how thin the batter is, that’s the correct consistency for pouring. Cover and chill in the fridge for at least 30 minutes. Heat an 18-20cm crêpe pan (or flat-bottomed frypan) on a medium heat and pop in a small dob of butter to grease. Pour in a generous ¼ cup of batter (60ml) and swirl to coat the pan evenly. Cook for about 2 minutes, then flip over. 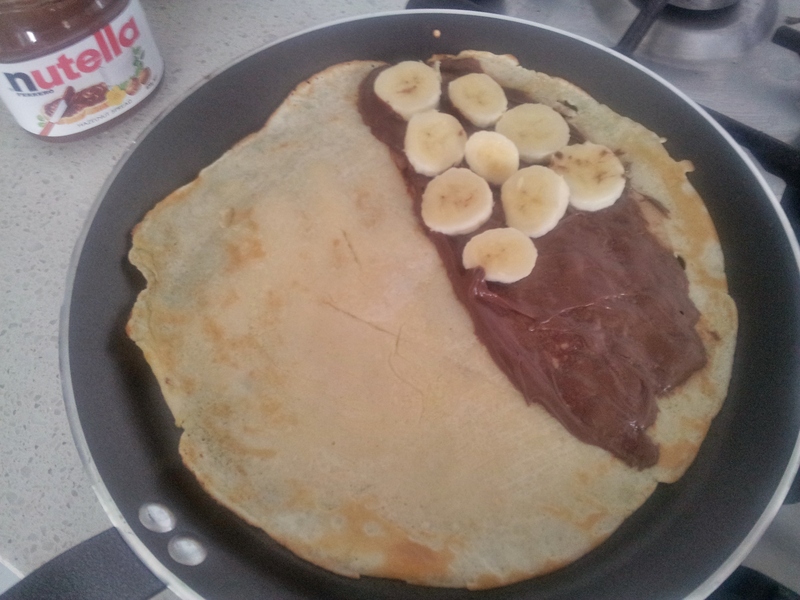 As soon as you have flipped it over, spread a heaped tablespoon of Nutella over half the crêpe and top with banana slices and coconut or any combination you’d like to try. Fold the un-adorned half over the Nutella half, and then fold in half again to give the cone shape in which they are usually served. The layers really add a lot to the crêpe so don’t be tempted to serve them unfolded. Enjoy as soon as it has been folded, which often results in ‘rounds’ of crepes being served at our house rather than eating breakfast together. But it’s worth this small inconvenience for everyone to enjoy warm crepes straight from the pan. Dear Reader, Kindly allow me to recommend these as a delicious choice for breakfast. The combination of coconut, chocolate and banana in a freshly made crepe cannot be surpassed. It is the sweet tooth’s choice. Bon apetit.